Over Labor Day weekend, while most were at cook-outs or enjoying the beach, we were assisting a homeowner after her house fire. We are committed to our 1-hour guaranteed response time and that does not bend for convenience. It goes above just plastering a slogan on our vehicles or website. It is about honoring our word. It is about the needs of the homeowner. 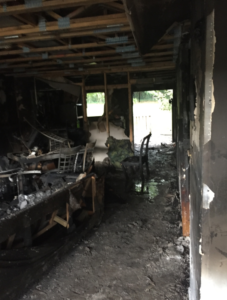 When we arrived at this town house fire on Labor Day weekend, the customer was standing alone outside her burned down house as the fire department was pulling away. She was wearing only the tattered clothes she escaped in and she did not even have a phone to call her family. This is exactly the type of situation that sparked our victim assistance program and creating a 1-hour response time. 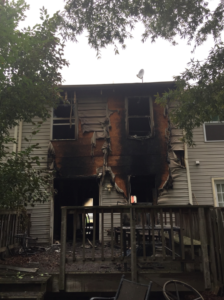 We saw countless homeowner’s left vulnerable and unsure of what to do after their major property loss. When our victim assistance director arrived, he was able to give that homeowner comfortable clothes, hot coffee and his phone to call her family. Had he not responded so quickly, what would she have done? Time and time again we hear about so called, “emergency response” companies who do not show up until the next business day at best and a week later at worst. This not only allows damage to worsen but it leaves the homeowner completely helpless. Even more importantly, our victim assistance director was able to offer her guidance on what to do next. He is not only a retired firefighter but he is also well versed in the insurance restoration business. He helped her call her insurance company and waited with her until her sister showed up. He also helped her figure out temporary housing and gave her a bag full of toiletries so she wouldn’t have to worry about one more thing. After serving our communities for the past decade on major property losses, the worst part of any fire was seeing homeowners left so vulnerable like this one. Emergency services have to be about more than just boarding up a property or water mitigation. They have to also include services for the homeowner like temporary shelter, toiletries and guidance. As a local business, we have a greater level of compassion for our customers. We operate our business with customer service as the focus rather than profit margins.It is this compassion that lead to 1-800-BoardUp and our victim assistance program. Emergencies do not take holidays off and people will always need help, which is why we will always honor our 1-hour response time.